To accompany research conducted by OnePoll to find the nation’s biggest worries, we put together a playful calculator. The calculator adds up all of life’s pressures to give you a ‘weight of worry’ to visualise the amount of worry you are carrying every day. Calculating the weight of stress on your shoulders it shows whether your worries are as light as a feather or as heavy as a grizzly bear. 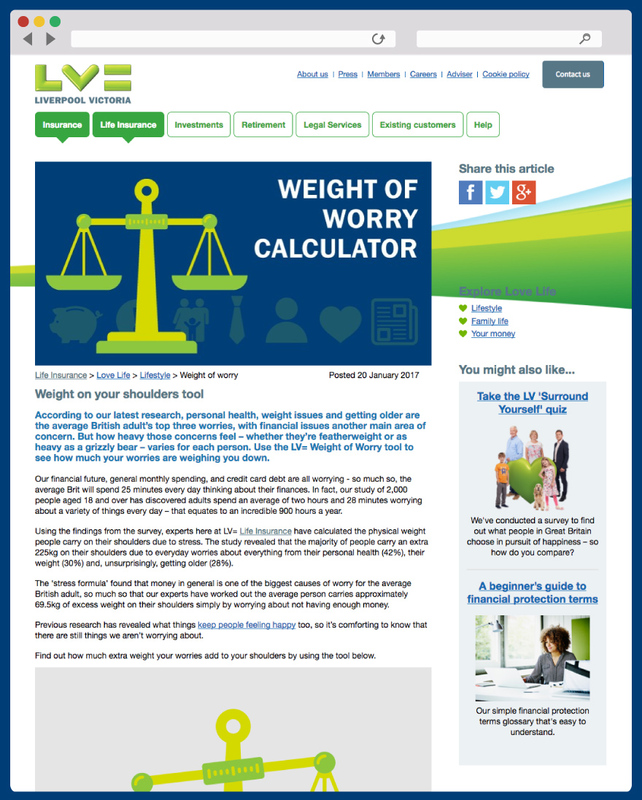 The formula to work out the ‘weight of worry’ was put together by Professor Kinderman, an expert in mental health. Using the research conducted it found that the nation’s average worry weight was a hefty 225kg. LV= embedded the tool on their blog and promoted it through various channels as well as offering ways to help reduce your worry.